Virgin Trains and Stagecoach shared in £51.2m worth of dividends from the West Coast main line railway, shortly before walking away from another franchise. Virgin Rail Group's dividends, for the year ending 31 March 2018, are almost double the £27.9m that was given back to its shareholders in 2015. The details come after the firms' East Coast franchise collapsed in June, with the government losing out on £2.3bn. Virgin said strong performance had led to record payments for taxpayers. But Labour said the failing rail system was "lining the pockets of billionaires". Virgin owns 51% of the operator which runs the West Coast main line connecting London to Glasgow - known as Virgin Rail Group - while Stagecoach owns the remaining 49%. The companies were also joint owners of the East Coast franchise. 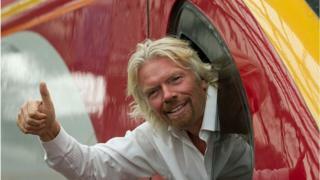 In June, both Stagecoach and Virgin Trains dropped out of the contract. The two firms ran the East Coast main line for three years from 2015, promising to pay £3.3bn to run the franchise until 2023. But by the end of 2017 it was clear they were in trouble, and in June the East Coast franchise was handed back to the government. At the time, Labour and trade unions accused Virgin of costing taxpayers £2bn. Mr Grayling told the House of Commons in May that Stagecoach and Virgin had lost almost £200m on the failed East Coast franchise, but there had not been a loss to taxpayers "at this time". Reacting to news of the West Coast dividend, Labour's Rachel Maskell told the BBC it was "shocking" that money from the franchise was not being put back into the railways. She said: "At the same time, Transport Secretary Chris Grayling is letting them off a £2bn bill [for the East Coast franchise] which the taxpayers are having to bail out. "This shows how franchising completely fails the public... buying a ticket is so extortionate these days that many people can't afford to travel by rail." She added that Labour wanted to see dividends reinvested into publicly-owned railways that put passengers at the heart of business. A spokesperson for Virgin Trains said that the West Coast line had seen "industry-leading levels of customer satisfaction thanks to innovations such as automatic delay repay, free films and TV on board, and mtickets". A Department for Transport spokesperson said that privatisation had helped to "transform" the UK's railways innovation, investment and improved customer service: "Virgin Trains continue to be the leading long distance operator in the National Passenger Survey results delivering consistently high customer satisfaction. "West Coast passengers will see ongoing investment and innovation with the introduction of the West Coast Partnership in 2019."